Six Senses Kaplankaya, Turkey will open its doors on 1st May 2018. The new 141 room, suite and villa resort – each with magnificent Aegean Sea views – will open up this glamorous new lifestyle destination located just a short hop from Bodrum, and capture all the very best that the laidback Mediterranean lifestyle has to offer. The resort is a complete passion project for the owners, and the long-term vision for family-owned Six Senses Kaplankaya is to create a high-end, environmentally-sensitive destination which will encourage positive economic and social growth in Turkey, whilst preserving the spectacular natural surroundings and heritage of the local area. Located across the bay from Bodrum on a naturally beautiful stretch of ancient Aegean coast, Six Senses Kaplankaya is carved into giant rock formations with green-roofed buildings layered down towards the coastline. Preserving its natural surroundings, the resort is surrounded by undulating hills clad in evergreens, rugged rocks, wild olive trees and cypresses, and flanked by secluded golden beaches and the turquoise sea’s lapping waves. Kaplankaya itself is steeped in history and art, with the Six Senses a striking mosaic of architecture blending world-class contemporary design with the diverse and dramatic landscape’s raw beauty. It is also within easy reach of many cultural and archeological sites, including two of the Seven Wonders of the Ancient World – The Mausoleum of Halicarnassus in Bodrum, and The Temple of Artemis at Ephesus near Izmir. Traditional Turkish hospitality begins with the arrival experience – be it by speedboat, slicing the foaming waves to a floating dock; by helicopter; or a picturesque drive up through hills fringed by ancient olive trees and vibrant flowers. Six Senses Kaplankaya will be home to one of the most extensive and advanced spa and wellness offerings within the Six Senses portfolio, providing guests and residents with a truly integrated approach to optimal wellness. Spread over an incredible 10,000m² (107,640ft²), the spa journey at Six Senses Spa Kaplankaya begins with a seven-metre (23-foot) meditation walk, illuminated by glowing ottoman patterns and a ceiling filled with glittering lights to create a magical and soothing guest experience. The spa is spread over two floors with 20 treatment rooms and comprises an impressive signature treatment menu. 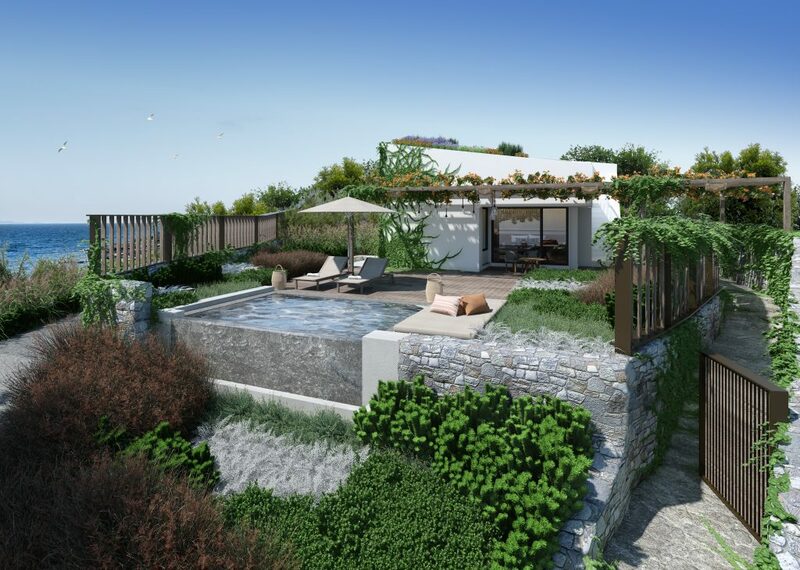 Six Senses Kaplankaya will be the first property to launch the Six Senses Holistic Anti-ageing clinic led by renowned neuroscientist Dr Claudia Aguirre. Wellness and beauty experts will analyse the impact of lifestyle habits and the effect on toxicity levels which can lead to premature ageing. Integrated with Sleep with Six Senses and Eat with Six Senses as well as movement and mindfullness, the clinic will curate personalised programmes around the key pillars of Sleep and Detox, Restore and Nourish to achieve tangible results. Facilities include multiple steam rooms, hydrotherapy pool, traditional Turkish Hamman, ice room, crystal steam room, Finnish sauna, private watsu pool, nail salon and hair salon, and the much-loved Six Senses Alchemy Bar – first introduced at Six Senses Douro Valley – where guests can skillfully blend organic and sustainable ingredients to create their own lotions and potions. Nutritionists, exercise physiologists and certified fitness instructors guide visitors through holistic healing practices, and programmes designed around movement, weight loss, cleansing and mindfulness. Packages such as ‘Yoga Gateway’, ‘Healthy Weight’ and ‘De-stress & Re-connect’, are on offer providing the latest advancements in preventative wellness. Adding to the wellness offering is a state-of-the-art gym, yoga studio and movement studio. Seamlessly bridging old and new, Six Senses Kaplankaya combines contemporary architecture and high-tech comforts for its 141 guestrooms including Suites and Pool Villas. Following the success of award-winning sister hotel Six Senses Douro Valley in Portugal, the design concept was once again led by leading New York-based design house Clodagh design. Clodagah pioneering eco-conscious spirit has perfectly captured the essence of stylish destination. Upon arrival, guests will walk through a lantern-lit portal through wooden doors and into a sky-lit lobby, where there is a glass railing to look down over the floors below and out to sea. Beneath the lobby, a sculptural collage of kilim rugs and leather-clad ottomans atop layered Turkish rugs are interspersed with tables crafted from large pieces of wood from the local olive trees. An expansive, gold-leaf wooden table glows, as it offers Turkish delicacies and signature beverages to arriving visitors. The warm, yet contemporary design influenced by traditional Turkish touches continues in the guestrooms where features include woven leather and local flat-weave carpets. The soft hues are grounding and conducive to sleep, along with two lamps specially designed to regulate circadian rhythms with the incorporation of indigo, ochre and flashes of deep turquoise lights. There is a generous walk-in closet, and a desk adorned with original paintings by Turkish artists. In-room amenities include high-spec coffee machines, a well-stocked minibar and a pass through to the outside corridor for the discrete delivery of room service. On the technology front, there’s an iPad for mood control of air-conditioning and lights, Marshall Bluetooth speaker and Wi-Fi. Six Senses Kaplankaya’s modern approach to food – newly-developed healthy eating programme, Eat With Six Senses – will help guests to eat more healthily by default by sourcing local produce from the resort’s organic garden and the region’s olive trees, local fish market and nearby villages. Mediterranean and Aegean-inspired cuisine is the overarching theme at the three dining venues: Sage & Sea Restaurant and Bar, Wild Thyme Restaurant and Bar, and Mezze by the Sea Restaurant. Guests will be able to enjoy tempting drinks at the Beach Bar at the resort’s main beach, and at the new Library Bar, which also offers morning snacks and coffee. It will be the place to see and be seen, as well as to get lost in a good book from the wide-ranging library wall. Day transitions to night via sliding doors at the back of the bar for ‘5 o’clocktail’ time, accompanied by spectacular sunsets across the bay. Wellness and sustainability go hand in hand, and the Six Senses Earth Lab showcases how Six Senses is supporting local communities and ecosystems. During their time at Six Senses Kaplankaya, guests will be invited to reconnect with the natural world and learn some simple life-hacks that will allow them to make a difference both when travelling and in their daily lives. Retail therapy offers all the buzz of a curated souk with a selection of sustainable jewellery, carvings, ceramics and crafts to purchase and home. Rugs from nearby towns are displayed like works of art, while weekly pop-up ‘mini bazaars’ throughout the resort bring in local artisans for the day to join the fun and allow guests to make connections to the local community. For families, Family Ridge Villas offer the ultimate in spacious accommodation, some complete with their own private pool. These are sheltered retreats offering a more nomadic experience within their own independent enclaves. Each villa has a small garden with either its own ancient olive tree, an outdoor shower, a plunge pool or a gorgeously-decorated cabana. A flower-filled garden has a terrace for outdoor dining, and deep cushions that can be joined for sunbathing or used for meditation. In the bathroom, a window seat offers yet another getaway with a garden view. Outside the villa walls, three beaches create the setting for thrilling water sports, while other activities include hikes to local villages to visit traditional artisans and archaeological sites, cooking classes and local market visits with the Chef, yacht tours, and sightseeing by helicopter. Family is truly at the heart of this destination, and so the Kid’s Club offers yoga, football, basketball, volleyball, swimming and painting for children aged from four years. Six Senses Kaplankaya also comprises a 250-berth marina and yacht club, a retail precinct, and plentiful sport and leisure facilities. In line with Six Senses design, sustainability and wellness pillars, Six Senses Kaplankaya creates a unique guest experience that addresses all the senses to achieve the ultimate in balance and wellbeing. Six Senses Kaplankaya is located just north of Bodrum on the Turkish Riviera. From Milas-Bodrum International Airport (BJV), guests can complete their arrival journey by car, yacht or helicopter, with the trip taking 50, 30 or 10 minutes respectively. Alternatively, the resort is approximately one hour 45 minutes from Izmir International Airport (ADB) by car.